Written by Nick Shubin. Thanks to Irina Stepanovska for help with the creation of this publication. THIS LICENSING AGREEMENT (“AGREEMENT”) IS A LEGAL AGREEMENT BETWEEN YOU, EITHER AN INDIVIDUAL OR A SINGLE ENTITY, AND BELIGHT SOFTWARE (“LICENSOR”). IF YOU DO NOT AGREE TO EACH AND EVERY TERM, YOU ARE TO CLICK “DISAGREE” BUTTON AND NOT TO OPEN, USE OR INSTALL THE SOFTWARE AND YOU MUST DELETE THE SOFTWARE FROM YOUR COMPUTER AND/OR ANY OTHER DATA STORAGE DEVICE. 1. GENERAL The software and documentation accompanying this License whether on disk, on any other media (collectively the “Software”) are licensed to you by BeLight Software (“Licensor”) for use only under the terms of this License, and Licensor reserves all rights not expressly granted to you. The rights granted herein do not include any other patents or intellectual property rights. 2. LICENSE Licensor hereby grants to You, and You accept, a non-exclusive license to install and use Software and Documentation, only as authorized in this license. You agree that You will not assign, sub license, transfer, pledge, lease, rent, or share Your rights under this license. You may not reverse engineer, decompile or disassemble the Licensed Software for any purpose whatsoever. 3. TRANSFER You may not distribute copies of the Software to any third party, nor may you use, rent, loan, sublicense, or lease the Software to third parties. You may, however, transfer all your rights to use the Software to another person or legal entity provided that: (a) You also transfer this Agreement, the Software and all other software bundled or pre-installed with the Software, including all copies, Updates and prior versions, to such person or entity; (b) You retain no copies, including backups and copies stored on a computer; and (c) the receiving party accepts the terms and conditions of this Agreement and any other terms and conditions upon which You legally obtained license to the Software. Notwithstanding the foregoing, You may not transfer pre-release or not for resale copies of the Software. 4. ILLEGAL USE You are not to use the Software, whether directly or indirectly, for any illegal purpose under the laws or ordinances of Federal, State, or local governments. It is Your sole responsibility to know and understand the laws and/or ordinances that govern the use of the Software. In the event that You violate any Federal, State or local law or ordinance by direct or indirect use of the Software, You shall take full legal responsibility for such illegal use. You shall hold Licensor harmless and without fault and otherwise indemnify Licensor for any damage, cost or liability incurred by Licensor as a result of any use, whether or not such use is within the scope of the license set forth herein. 5. UPDATES You may continue to use the previous version of the Software on your computer after You receive the Update to assist You in the transition to the Update, provided that: the Update and the previous version are installed on the same computer; the previous version or copies thereof are not transferred to another party or computer unless all copies of the Update are also transferred to such party or computer; and You acknowledge that any obligation BeLight Software may have to support the previous version of the Software may be ended upon availability of the Update. 6. LICENSOR’S RIGHTS You acknowledge and agree that the Software and Documentation consists of proprietary, published and unpublished property of Licensor. You further acknowledge and agree that all right, title, and interest in and to the Software and Documentation are and shall remain with Licensor. This license conveys to You the right to install and use the Software and Documentation in accordance with the terms of this license. All rights not expressly granted here are reserved by BeLight Software. The Licensor will not transmit your personal information to any third party without your express consent. 7. TERMINATION This license is effective upon Your installing the software on any machine, and shall continue until terminated. You may terminate this Agreement at any time. The Licensor may immediately terminate this License Agreement if you breach any representation, warranty, agreement or obligation contained or referred to in this License Agreement. Upon termination, you must dispose of the Software and all copies or versions of the Software by destroying the Software. 8. LIMITED WARRANTY BeLight Software provides a thirty (30) day money-back guarantee on the Software. If, during this period, you are dissatisfied with the Software for any reason, BeLight Software will refund your money if you return the Software and all copies to the place of purchase within thirty (30) days of the date of the original purchase. THE FOREGOING IS THE SOLE AND EXCLUSIVE WARRANTY OFFERED BY BELIGHT SOFTWARE. BELIGHT SOFTWARE DISCLAIMS ALL OTHER WARRANTIES, EXPRESS OR IMPLIED, INCLUDING BUT NOT LIMITED TO THE IMPLIED WARRANTIES OF MERCHANTABILITY AND FITNESS FOR A PARTICULAR PURPOSE, WITH REGARD TO THE LICENSED SOFTWARE AND ALL ACCOMPANYING MATERIALS. BELIGHT SOFTWARE AND ITS AGENTS DO NOT AND CANNOT WARRANT THE PERFORMANCE OR RESULTS YOU MAY OBTAIN BY USING THE SOFTWARE. 9. LIMITATION OF LIABILITY IN NO EVENT WILL BELIGHT SOFTWARE OR ITS AGENTS BE LIABLE TO YOU FOR ANY DAMAGES, CLAIMS OR COSTS WHATSOEVER OR ANY CONSEQUENTIAL, INDIRECT, INCIDENTAL DAMAGES, OR ANY LOST PROFITS OR LOST SAVINGS. BELIGHT SOFTWARE’S AGGREGATE LIABILITY AND THAT OF ITS AGENTS UNDER OR IN CONNECTION WITH THIS AGREEMENT SHALL BE LIMITED TO THE AMOUNT PAID FOR THE SOFTWARE, IF ANY. 10. FEES You may register your copy of the Software by purchasing a License Code for the download version at: http://www.belightsoft.com/buy/ You may not distribute the License Code. By clicking “Agree”, you acknowledge that you have paid the Licensor all applicable license fees for the Software. 11. SEVERABILITY Should any term of this license be declared void or unenforceable by any court of competent jurisdiction, such declaration shall have no effect on the remaining terms hereof. 12. GENERAL PROVISIONS This License Agreement is personal between You and BeLight Software. It is not transferable and any attempt by You to rent, lease, sublicense, assign or transfer any of the rights, duties or obligations hereunder. YOU ACKNOWLEDGE THAT YOU HAVE READ THIS AGREEMENT, UNDERSTAND IT AND AGREE TO BE BOUND BY ITS TERMS AND CONDITIONS. YOU FURTHER AGREE THAT IT IS THE COMPLETE AND EXCLUSIVE STATEMENT OF THE AGREEMENT BETWEEN YOU AND BELIGHT SOFTWARE WHICH SUPERSEDES ANY PROPOSAL OR PRIOR AGREEMENT, ORAL OR WRITTEN, AND ANY OTHER COMMUNICATIONS BETWEEN YOU AND BELIGHT SOFTWARE OR BELIGHT SOFTWARE’S AGENT(S) RELATING TO THE LICENSED SOFTWARE. If you have any questions regarding this Agreement or if you wish to request any information from BeLight Software please use the address and contact information included with this product to contact BeLight Software. © 2010 BeLight Software, Ltd. All Rights Reserved. BeLight Software and Art Text are trademarks of BeLight Software, Ltd. Mac, the Mac logo, Mac OS X, iPhoto, and Macintosh are trademarks of Apple Computer, Inc. All other trademarks, registered trademarks, product and/or brand names are the sole property of their respective owners. 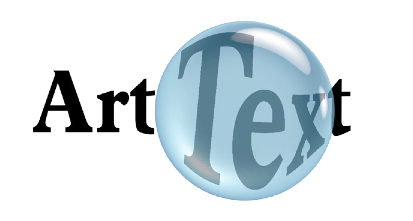 The Art Text application is intended for creating unique textual graphics by applying effects to text and vector shapes. Your work can be saved in the native Art Text format or in common graphic file formats. Images created in Art Text can be used in publishing materials, on web pages, or in other applications. The program is supplied with well tuned styles that can be applied to your original text or graphics. The retail version of Art Text includes additional fonts. From time to time, the software developer releases new versions of the product. To change your copy to a new version, you just need to install an update. Before launching the update installer, make sure that the application and the supporting files are at the default location. Usually they are if you have followed the installation procedure and didn’t change paths or transfer files manually. The default file location can be found in the “Installing and Removing Art Text” section. • Bold Text is used for names of menu items, shortcuts, buttons, radio buttons, edit boxes, check boxes and other controls. • Text in Italics is used for names of windows, dialog boxes, panels, tabs and other elements of the program interface. Such text formatting is used for names of programs, files, folders and web links. It is also used for chapter and section references, and to introduce important remarks. • For menu items hierarchy, the “>” symbol is used. 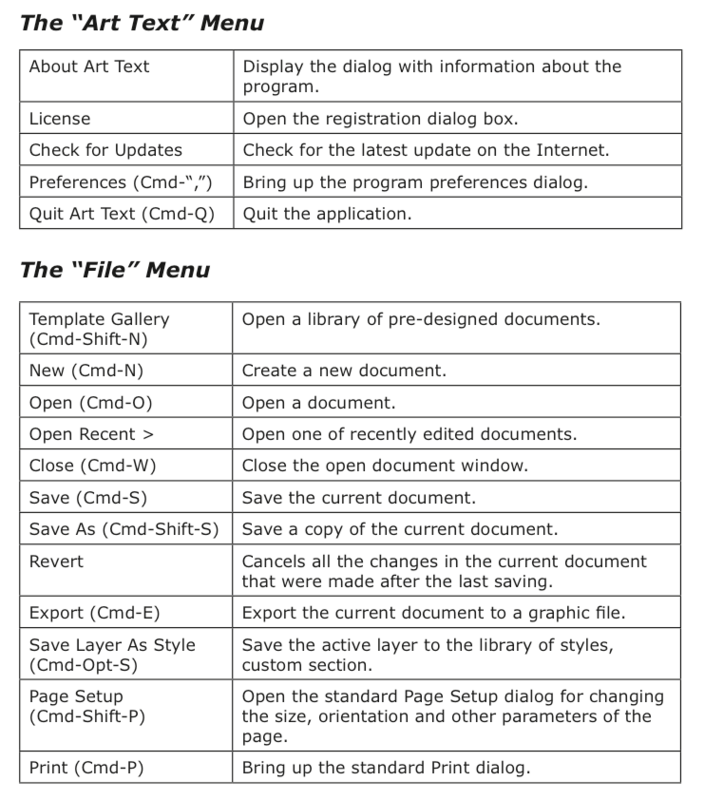 A record File > Open is equivalent to “the Open item under the File menu”. • A shortcut (shortkey) is one or several keys which are pressed together. Cmd-S means you should hold down the Command (Apple) key while pressing the S key, then release them. • Ctrl-click is a click holding the Ctrl key down. Right-click is a click by the right button of a two-button mouse. Both actions are equivalent. • Context (contextual or shortcut) menu is a pop-up menu which contains options that vary depending on the object (image, text, etc.) you have clicked on. To open the context menu, right-click or Ctrl-click on the object. By registering online, you are sending your data to the developer’s data base. This makes it possible to send your license code back to you in case it gets lost. The online registration does not turn the program from the demo to the registered mode. 2. Set up the program Preferences (Art Text > Preferences...). 5 – Choose your preferable background. Working with white background is better for beginners as the preview area looks like an ordinary page. The chessboard background lets you see transparent parts of your design. More details can be found in Chapter 3, “Art Text Interface” > “Program Settings”. 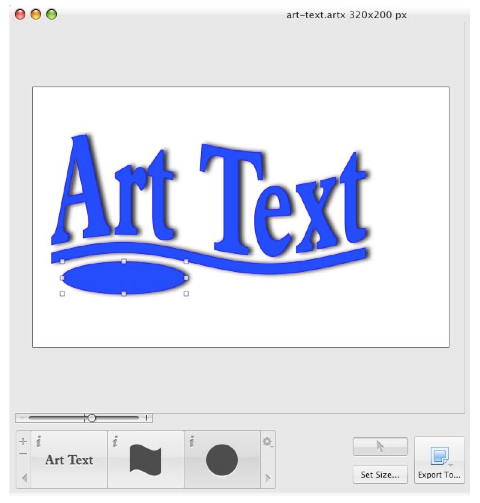 By default the “Art Text” text is displayed on the canvas. To change text or replace it with an image, double-click the “Art Text” icon in the bottom panel (Layer bar). 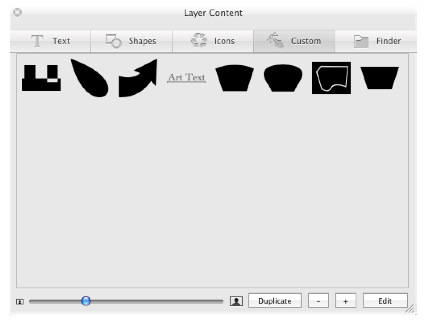 This will bring up the Layer Content panel displaying the Text tab. 1. Add a new layer. 2. Move its icon in the Layer bar to the leftmost position. 3. Double click the icon to open the Layer Content panel. 4. Open the Shapes tab of the panel. 5. Click on a rectangle and close the panel. 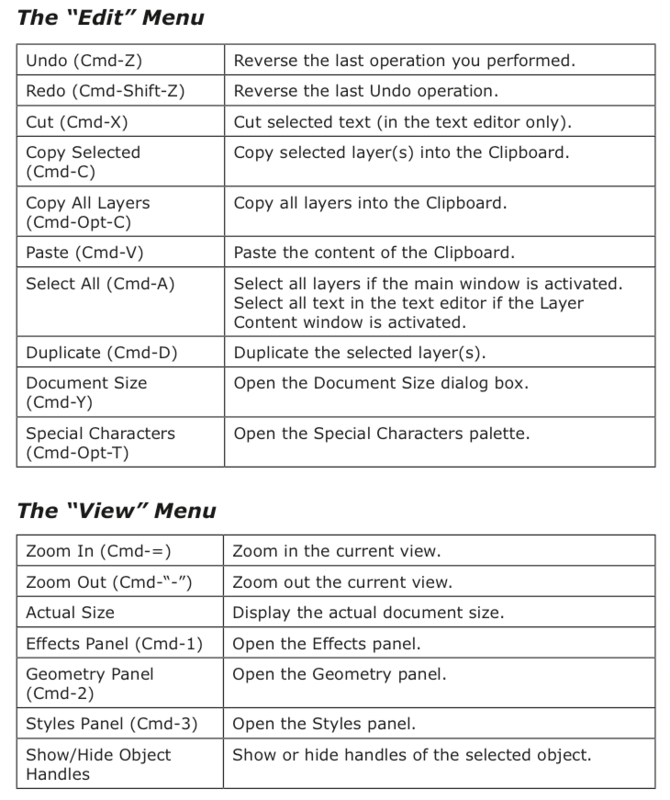 To save your document, choose File > Save in the menu. 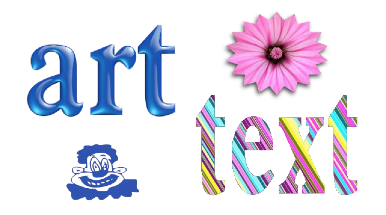 Below are represented graphic effects that can be applied in Art Text. 1 – The Layer bar displays icons of all layers in your document. 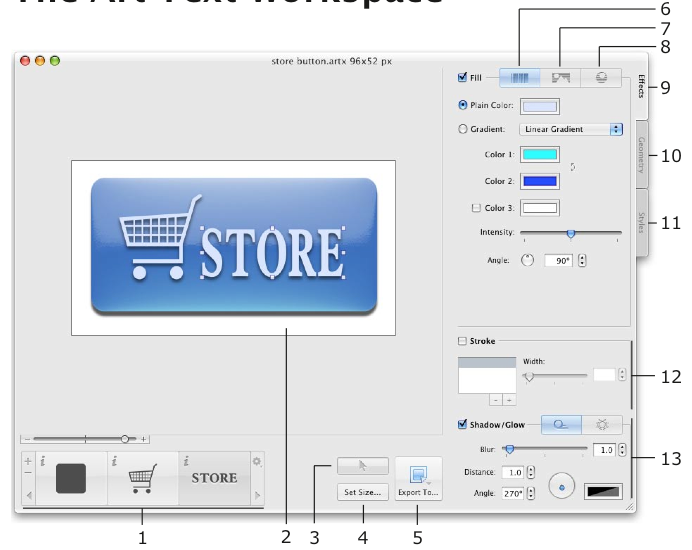 It lets you add and delete layers, change their stacking order, and change the layer content. 2 – Canvas. This is the area where you preview the image. 3 – The “Hide/Show Layer Border” button. Handles on the border are used for resizing objects. 4 – The Set Size button. Click it to change the document size (dimensions of the final image). 5 – The “Export To...” button. Click it to copy the image to the clipboard or export it to a graphic file. 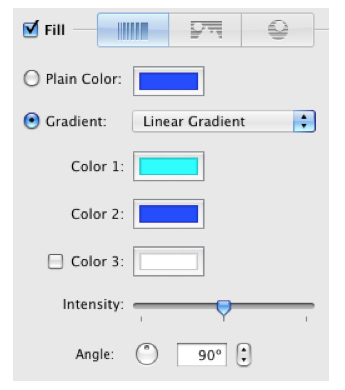 6 – The plain color and gradient fill tools. 7 – The texture library. 8 – The material library. 9 – The Effects tab contains the Fill section, the texture and material libraries. 10 – The Geometry tab contains transformation patterns. 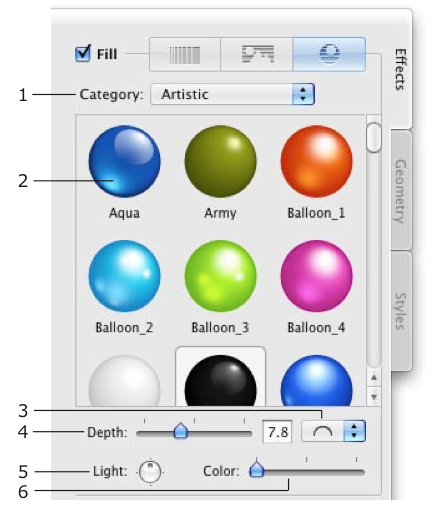 11 – The Styles tab contains the library of styles (pre-designed sets of effects that can be applied at once). 12 – The Stroke tool. 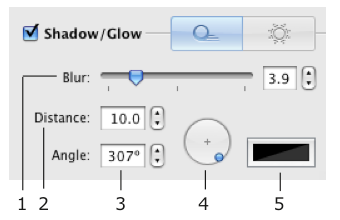 13 – The Shadow and Glow tools. 1 – Open the built-in library of templates when the program starts. 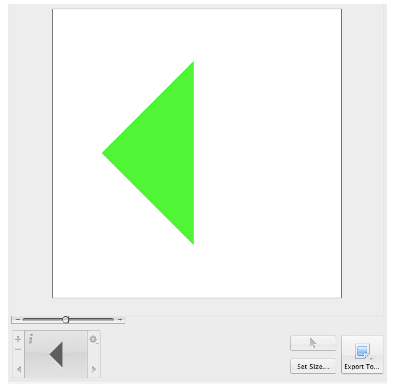 2 – Automatically align an object to other objects when you move or resize it. 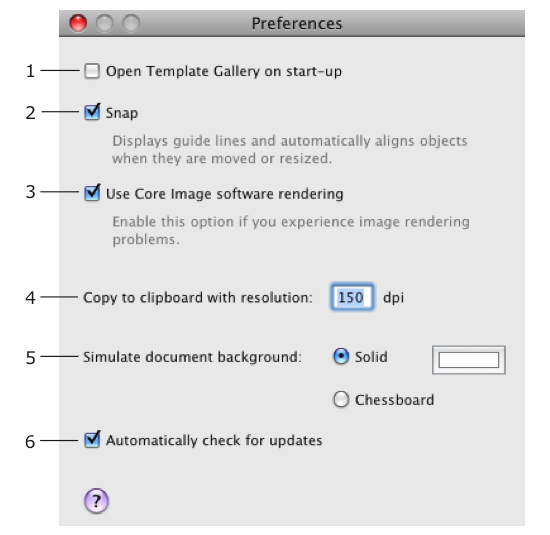 3 – Use Core Image software renderer – activates software rendering instead of rendering by the graphic processor. Select this check box when the exported image contains artifacts (for instance, unwanted vertical or horizontal lines across the image). Software rendering may be slower than rendering by the graphic processor. 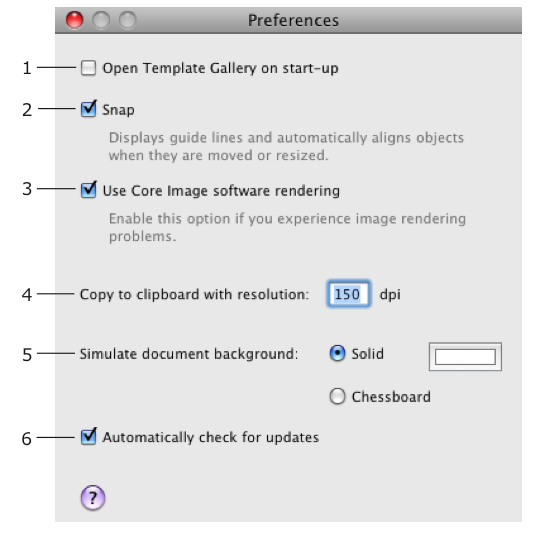 4 – Resolution of images copied to the clipboard. It is important when you copy the final image to another application. Display the dialog with information about the program. Open the registration dialog box. Check for the latest update on the Internet. Bring up the program preferences dialog. Open a library of pre-designed documents. Open one of recently edited documents. Close the open document window. Save a copy of the current document. Cancels all the changes in the current document that were made after the last saving. Export the current document to a graphic file. Save the active layer to the library of styles, custom section. Open the standard Page Setup dialog for changing the size, orientation and other parameters of the page. Bring up the standard Print dialog. Reverse the last operation you performed. Reverse the last Undo operation. Cut selected text (in the text editor only). Copy selected layer(s) into the Clipboard. Copy all layers into the Clipboard. Paste the content of the Clipboard. Select all layers if the main window is activated. 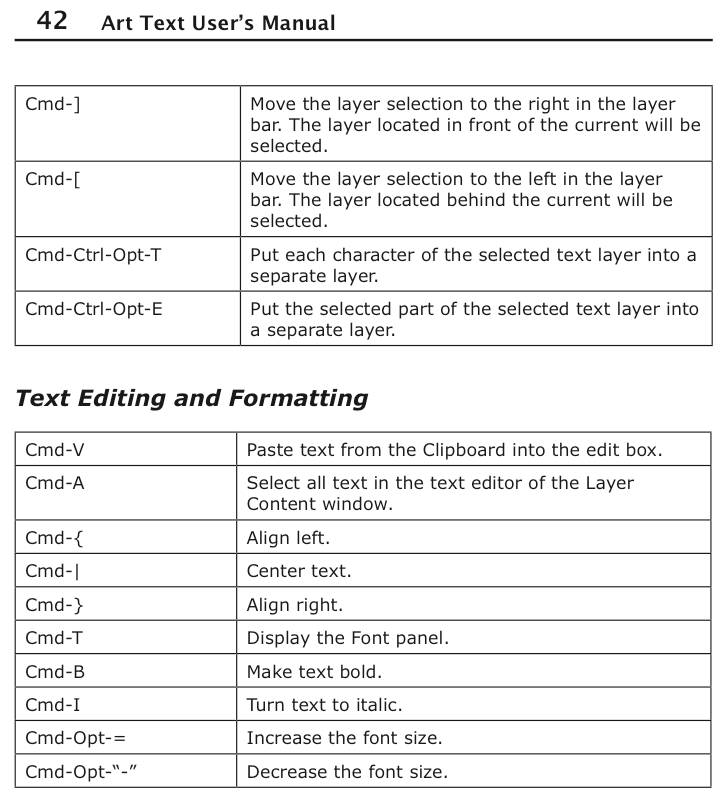 Select all text in the text editor if the Layer Content window is activated. Open the Document Size dialog box. Open the Special Characters palette. Display the actual document size. Show or hide handles of the selected object. Add a new layer to the top of layer stack. 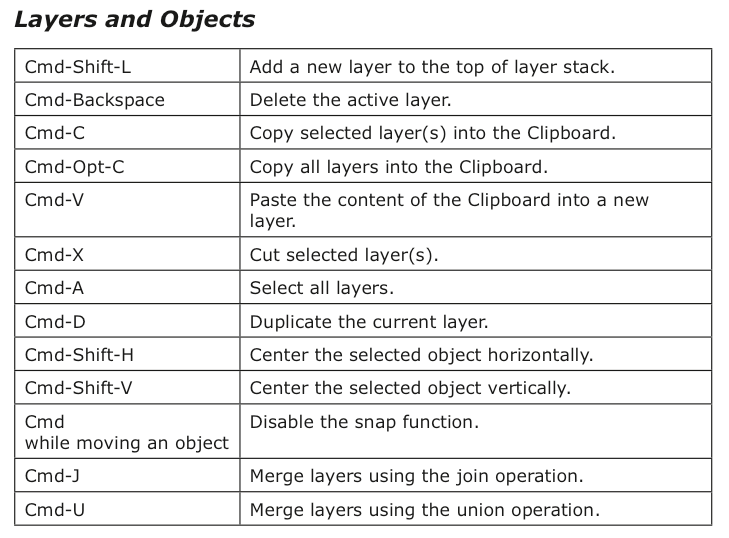 Merge layers using the union operation. Merge layers using the join operation. Merge layers using the subtract operation. Merge layers using the intersect operation. Put each character of the selected text layer into a separate layer. 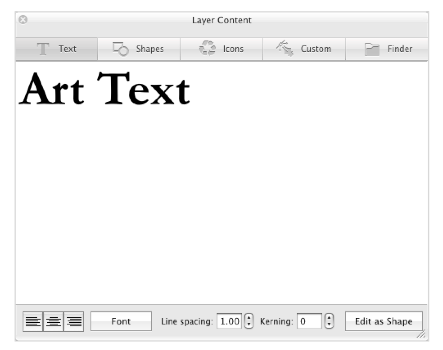 Put the selected part of the selected text layer into a separate layer. Move the layer selection to the right in the layer bar. The layer located in front of the current will be selected. Move the layer selection to the left in the layer bar. The layer located behind the current will be selected. Modify the properties of the selected text. Increase/decrease the size of the selected text. Align text to the left, right, center or justify it. Fit the content to the document size constraining proportions. Fit the content to the document size without constraining proportions. Minimize the currently active window. Fit the program window to the screen size. Show or hide the Layers panel. Show or hide the Layer Content window. Open Help documentation delivered with the application. Open the web site of the Art Text manufacturer. Send Feedback..Lets you send feedback to the developers by e-mail. Online Registration..Open the online registration form. Save the active layer to the library of styles into the custom section. Close the active document window. Paste the content of the Clipboard into a new layer. Center the selected object horizontally. Center the selected object vertically. Paste text from the Clipboard into the edit box. Select all text in the text editor of the Layer Content window. To create a new document, choose File > New in the menu. To open an existing document, choose File > Open in the menu. Or double- click on a document file in Finder. 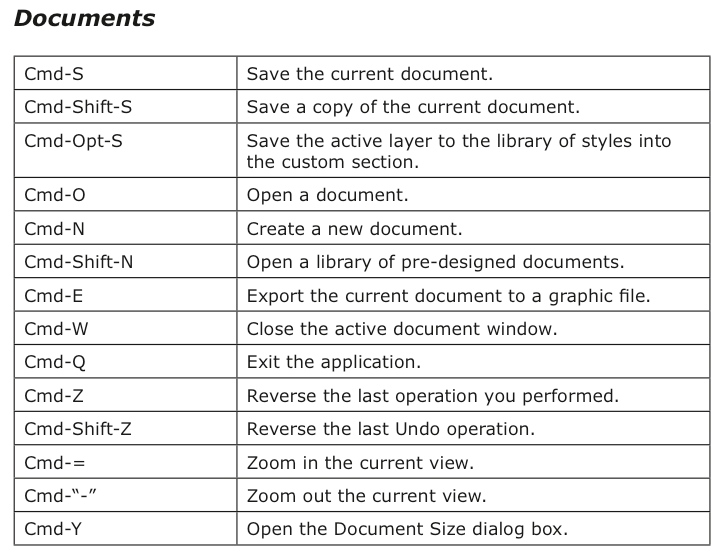 To save a document, choose File > Save in the menu. To set up the document size, choose Edit > Document Size, or click Set Size... in the main window. 1 – Measurement units used for the whole application. 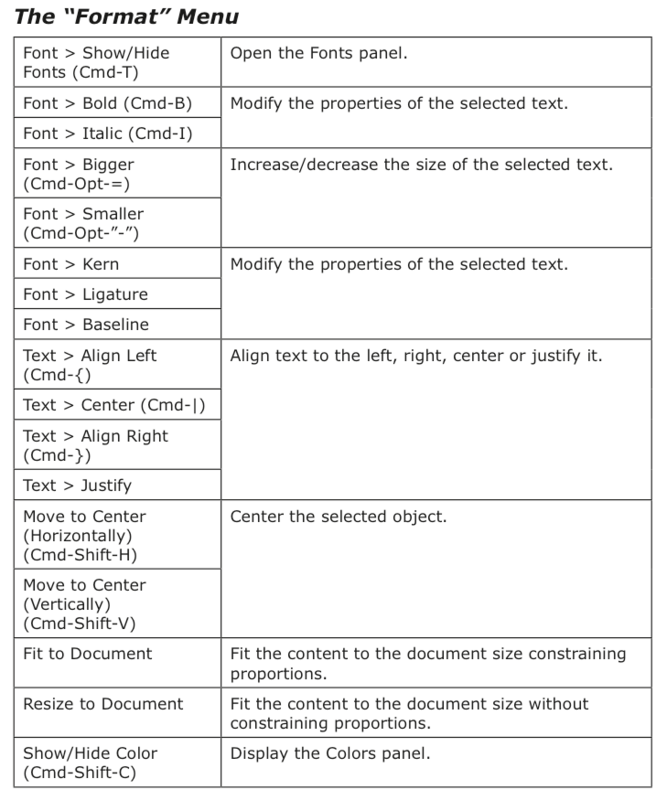 2 – Maintain proportions when one of document sides was changed. The current document width and height are used to calculate the side proportion when you open the Document Size dialog box. 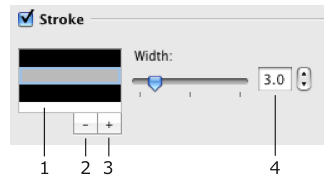 This value is used to calculate new height or width until you click OK.
3 – The Set Size button changes the document size so that all visible objects are included. The amount of the blank space around the objects can be set by the margins control. 5 – The Automatically resize objects check box activates resizing the design when you change the document size. Proportions of the design are constrained. 6 – Choose one of previous document sizes. For default document size for new documents, the program takes the last applied width and height. The object term is used here for text or an image. Note that parts of text can be separate objects as in the picture below. An object can be selected, in this state its resize handles are displayed. Objects in Art Text are located one over another forming a layered structure. One layer contains only one object. Adding or removing a layer means also adding or removing an object. No object can exist without a layer. Some operations provided in Art Text are natural for objects (changing color or creating a shadow effect). Others are natural for layers (merging layers). When we discuss the object layering, we will talk about layers. When we mention the layer content or applying effects, we will talk about objects. Tools for working with layers usually change the appearance of the content. 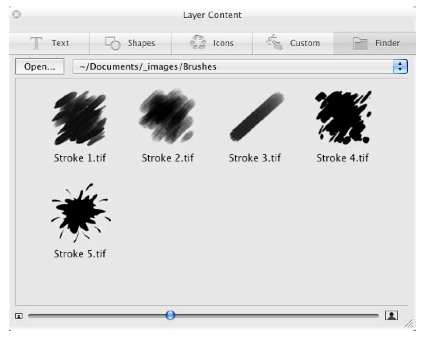 For working with layers, you will use the Layers panel and the Layer bar. See Chapter 5, “Working with Layers” > “Managing Layers”. To choose an image or edit text, you should use the Layer Content window. See Chapter 5, “Working with Layers” > “The Layer Content Window”. To modify objects, you will use the Effects (Cmd-1), Geometry (Cmd-2) or Styles (Cmd-3) tab. Before setting up the size of an object, check the document size that defines the size of the final image (displayed by white or chessboard background). For this, click the Set Size button in the main window. 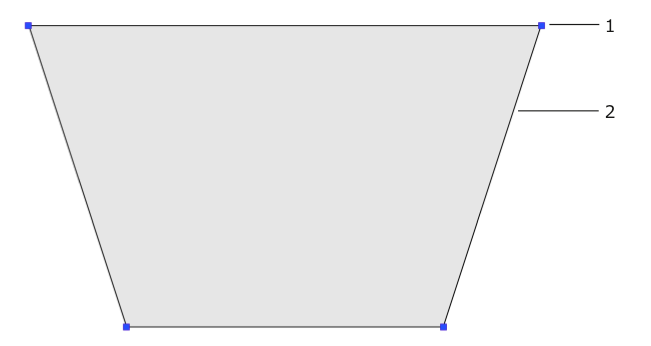 To resize an object, drag its corner or side handle. If the handles are invisible, click the Hide/Show Object Handles button in the main window (View > Hide/Show Object Handles). The handles are also used to define the active layer. 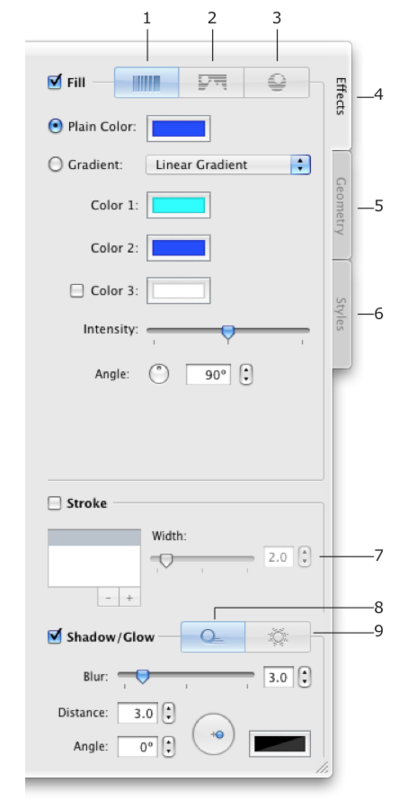 To set the size of the object precisely, use the Layers panel. 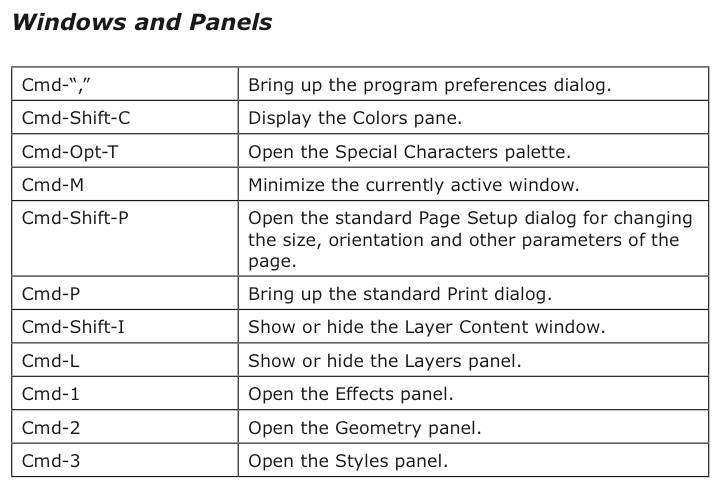 Choose Window > Show/Hide Layers Panel (Cmd-L). To make an object to meet the document size, use Format > Fit to Document or Format > Resize to Document. The Fit to Document function resizes text or image proportionally so that its bigger size fits the documents size. The Resize to Document function does not constrain the proportion. The Use Font Size button in the Geometry tab restores the original text size. After clicking the button, the size of letters corresponds the font size set in the Fonts panel. To move an object to other location, drag it with the mouse. While you are moving it around, guide lines can appear showing that the object has aligned to other object or to the center of the work area. If this is enabled in the program Preferences, the object you are moving snaps to other objects. For temporary disabling the snap function, hold the Cmd key while you are moving an object. To move the selected object that lays behind others, press and hold the Option key before you start moving the object. This will prevent occasional selection of another object. To set up numeric coordinates of the selected object, use the Layers panel. 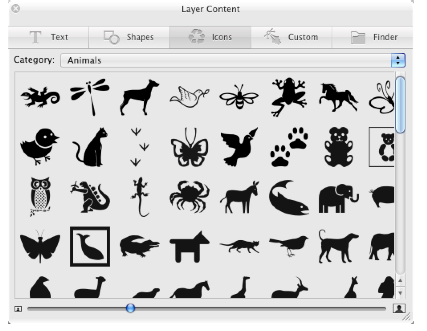 Functions related to layers are located in the Layers panel and Layer bar. The Layers panel: • adding an removing layers; • renaming layers; • changing the order of layers; • changing the layer opacity; • changing the size of an object; • rotating layers; • flipping the layer content. The Layer bar: • adding an removing layers; • duplicating layers; • changing the order of layers; • changing the content of a layer; • merging layers. 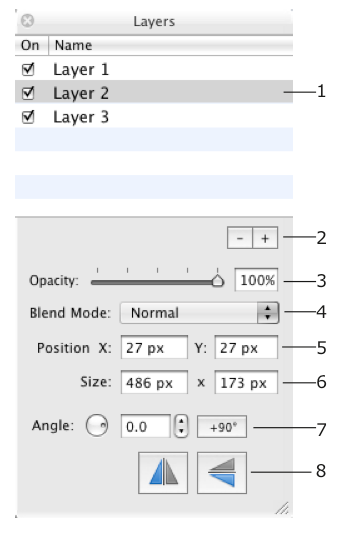 The Layers panel displays a list of layers (1 in the picture). The active layer is highlighted. Its parameters (3 – 8) are displayed below the list. 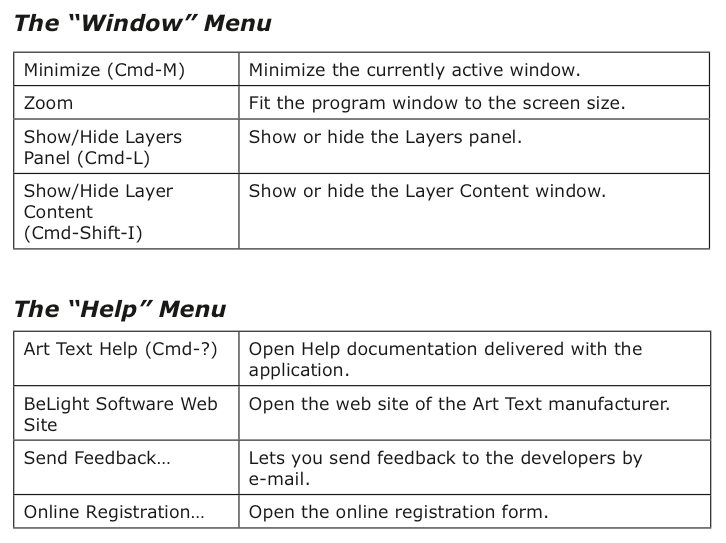 To open or close the Layers panel, choose Window > Show/Hide Layers Panel (Cmd-L). 1 – List of layers. 2 – Remove Layer and Add Layer buttons. 3 – Opacity of the layer content. 4 – Blend mode selector – the way of blending the content of layers. See Chapter 5: “Working with Layers” > “Blending Layers” for more details. 5 – Position of the selected object in the document. The zero point is the bottom left corner. 6 – Size of the selected object. You can also resize the object using the resize handles. 7 – Rotate the layer content. 8 – Flip the layer content. You can change parameters of several selected layers together. To select several layers, click on their names holding the Cmd or Shift button. To change the layer name in the list, double-click on it. 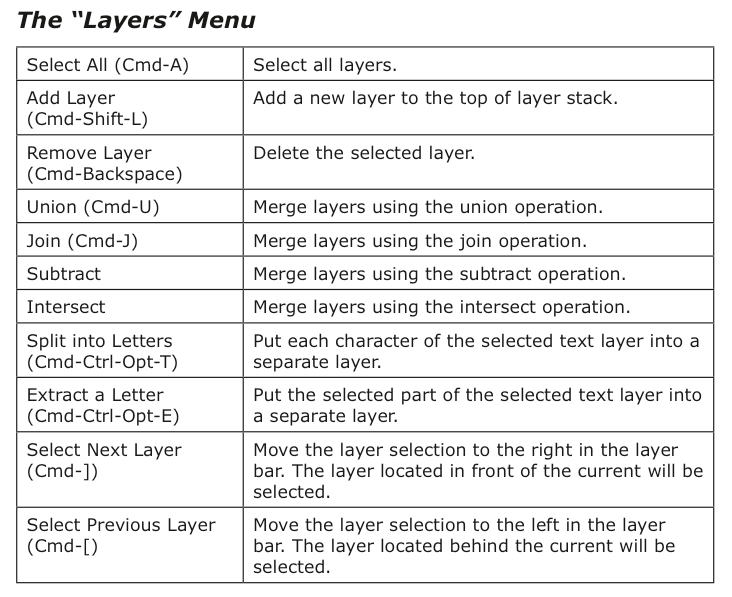 The order of layer names in the list reflects the layer stack order. It determines how objects overlap one another. The layer located at the top of the list is atop others. The layer at the bottom of the list is behind all other layers. To change the stack order, drag the layer name to a new position in the list. Click a check box next to each layer name to hide or show the layer content. Click the “plus” button to add a new layer. To create a copy of an existing layer, use the Duplicate function in the Layer bar. Click the “minus” button to remove the active layer. The Layer bar is located at the bottom of the main window and displays icons of layers. When a layer is selected, its icon becomes highlighted. Several layers can be selected to modify them together. To change the layer stack order, drag an icon to the left or right. The rightmost icon corresponds to the top layer. The star is on top of the other shapes in the left picture. Its icon is in the rightmost position in the Layer bar. Moving the icon to the left (see the right picture), you move the star behind other objects on the canvas. To change text or an image in the active layer, open the Layer Content window by double-clicking the layer icon. To choose a graphic file for the active layer, you can also drag it from the Finder application and drop onto the layer icon in the Layer bar. 1 – Add a new layer with the default content. 2 – Delete layer and its content. 3 and 8 – Scroll layer icons. 4 – Click the “i” icon to open the Layer Content window. 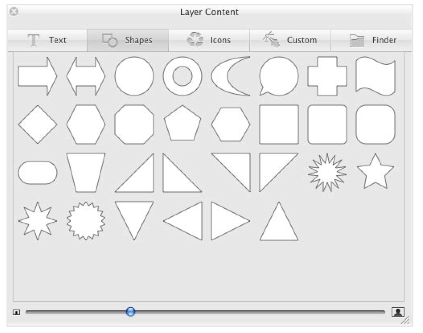 5, 6 and 7 – Icons of layers displaying the layer content. choose an image to place in it. Use this feature for adding background images. • choose an image file. To open the Layer Content window, double-click the layer icon in the layer bar at the bottom of the main window. The Text tab can be used as a simple text editor. You can type your text right here or paste text from other sources. The alignment buttons affect the whole text. The Font button opens the standard Font panel. You can change the font of the selected part of text or of the whole text. Line spacing can be applied to selected text lines or to the whole text. Kerning changes the distance between letters of the selected text. 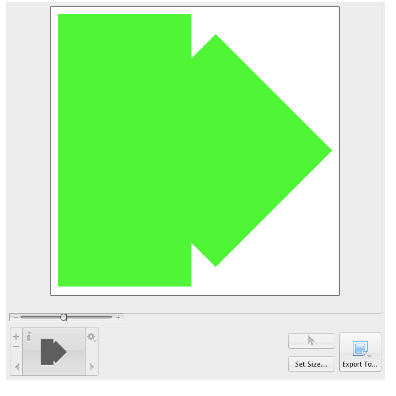 To convert text to a vector image, click the Edit as Shape button. The created image will be opened in the vector image editor. Open the Shapes tab and click on a shape thumbnail. The buttons and scroll bar at the bottom change the thumbnail size. 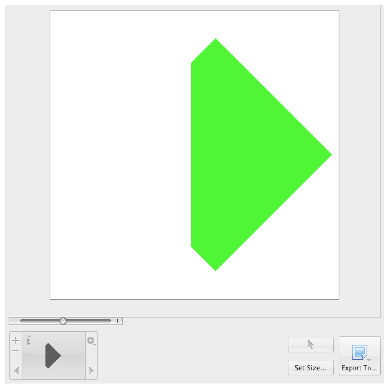 To modify a shape in the vector image editor, double-click on it. Open the Icons tab, select a category in the drop-down menu and click on an icon thumbnail. The buttons and scroll bar at the bottom change the thumbnail size. To modify an icon in the vector image editor, double-click on it. To choose an image you have previously created, open the Custom tab and click on an image. 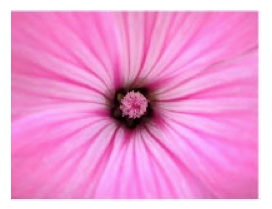 To modify an image in the vector image editor, double-click on it. Open the Finder tab, click the Open button and choose a folder containing images or an individual graphic file. Then click Open. Select an image in the Layer Content window. Previously selected folders are listed in the drop-down menu. You can choose one of the folders in the list instead of navigating to it by the Open button. The buttons and scroll bar at the bottom change the thumbnail size. 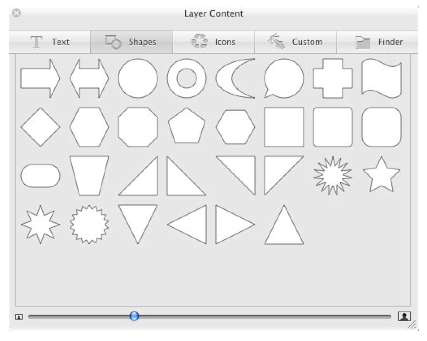 To merge layers, select two or more layers and choose Union, Join, Subtract or Intersect. These options are located in the actions menu (click on the wheel icon in the layer bar) and also under Layers in the main menu. The result depends on how the objects overlay. Here matter the shape of the original objects and applied geometric transformation. Properties (such as color, shadow, texture, etc.) will be re-applied to the resulting object. The result is a single object (there is an exception for Intersect). Only selected layers are affected. 1. The operations combine objects of selected layers together in one new layer. The original layers disappear. The resulting object is a vector image created out of vector outlines of the original objects. Text is not text any longer but a vector image and further text editing is impossible. Merging is not grouping. You cannot split layers back after they were merged (unless you choose Edit > Undo). 2. Don’t confuse merging layers with blending layers. Choosing a blending mode, you define how the content of layers will look in the final image. The content of layers stays unchanged. Note that if you merge an image from the Finder tab of the Layer Content window, the program will use the rectangular shape of the whole image, not the alpha channel (transparency). If the objects overlay, the overlapping area becomes excluded (transparent). Without overlaying, the result is similar to the Union operation. The resulting layer shape is sum of merged layers shapes. The shape of the object in the lowest layer is the basis for a new shape. The other objects determine the area(s) that will be cut off. The result is a part of the lowest object that is not overlaid by other(s). If the objects don’t overlay, the result looks like the lowest object. The result is the area(s) where all the selected layers overlap. If there are no such areas, the program doesn’t modify the document. Your design idea may require applying different effects to different parts of text. The program allows you to use the same color, material, or texture with the whole layer. To apply different effects to individual letters, you have to put them into separate layers. The program can help you create multiple layers out of a text layer. To make sure that you have a text layer, double-click on it. The Text tab of the Layer Content window should open displaying the text. Note that you cannot merge the resulting layers back to create one text layer (except using the Edit > Undo command). 1. Select a text layer. 2. Select Layers > Split into Letters (Cmd-Ctrl-Opt-T). Or, right-click on the layer and select Split into Letters in the context menu. 2. Choose Layers > Extract a Letter (Cmd-Ctrl-Opt-E). Or, right-click on the layer and choose Extract a Letter in the context menu. 3. Select one or several characters that you want to separate. In the same original document as in the example above, the letter “é” was separated. We have three layers that contain everything before “é”, “é”, and the rest of the word. The blending mode defines how a layer interacts with layers behind it. 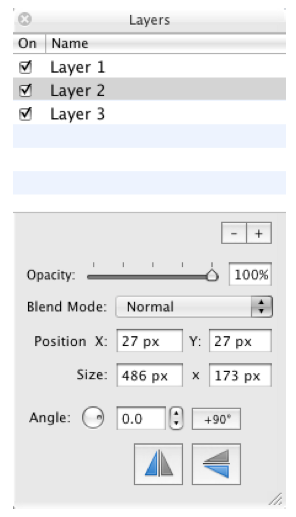 To choose a blending mode, use the Layers panel (Cmd-L). Some blending modes are described below with examples. The examples show how the blending mode of the top layer (active) affects the final image compared with the default settings. Two other layers are set to the Normal mode. Changing blending mode of several layers, you may get different results. The Opacity parameter was set to 100% by all the layers. The active layer will be shown at 100% and 50% opacity. Changing the opacity of the top layer significantly changes the final image. By default, a new layer has the Normal blending mode and 100% opacity. Layers appear in the original layering order. Parts of lower layers, that are overlaid by the top layer, are excluded. Parts of the top layer, that overlay other layers, are excluded too. Parts of lower layers, that are overlaid by the top layer, became darker. Parts of lower layers, that are overlaid by the top layer, become lighter. Only those parts of the top layer remain visible, that overlay any lower layer. The rest is excluded. Only those parts of the top layer remain visible that don’t overlay any lower layer. The rest is excluded. Parts of the top layer, that don’t overlay any lower layer, are excluded. Parts of the top layer, that overlay any lower layer, are excluded. Looks like the top layer is behind all others. Only those parts of lower layers remain visible that lay behind the top layer. Only those parts of lower layers remain visible that are not overlaid by the top layer. Only those parts of lower layers remain visible that are overlaid by the top layer. And parts of the top layer that don’t overlay any lower layer stay visible. The rest is excluded. 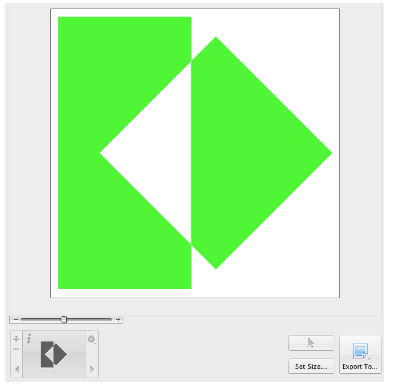 The built-in editor of vector shapes lets you create new vector images. Also, you can modify icons and shapes provided in the Layer Content window, and you can edit text as a vector shape. Vector images you have created are located in the Custom tab of the Layer Content window. To create a new image, click the “+” button. To remove an image, select it and click the “–” button. To create a copy of an image, select it and click the Duplicate button. To edit an image, select it and click the Edit button. Or, double-click on this image. To choose an image for the current layer, click on it. To open the editor, click the Edit or “+” button in the Custom tab of the Layer Content window. 1 – The selection tool is used to select or move points. 2 – The straight segment tool. 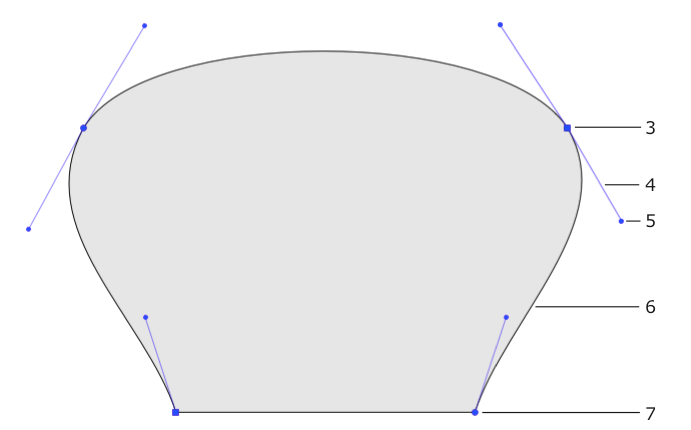 3 – The curved segment tool. 4 – The rectangle tool. 5 – The ellipse tool. 6 – Add an anchor point. 7 – Delete an anchor point. 8 – Change the anchor point type. 9 – Clear the canvas. A vector shape comprises anchor points and lines that connect them. Anchor points mark the beginning and end of each line (or segment). By adding one line after another you create a path. The path must be closed. This means that it begins and ends with the same point. Anchor points can be of two types: corner point and smooth point. When you change the type of a point, intersecting lines may change from curved to straight and vice versa. 1 – Corner point. At a corner point, a path abruptly changes direction. A corner point may join either straight or curved lines in any combination. A corner point with two straight lines doesn’t have direction lines. 3 – Smooth point. At a smooth point, a path continue following the same direction. A smooth point joins only two curved segments. 5 – Direction point. It is a handle on the end of a direction line. Moving a direction point, you can change the length and angle of the corresponding direction line. 6 – Curved segment. 7 – Corner point. The direction of a curved path in a smooth anchor point coincides with the direction of the direction line. Leaving the anchor point, the path branches off from the direction line. The longer the direction line is, the longer the path passes near it. Select the straight segment 1 or curved 2 segment tool. Click on the canvas to add as many anchor points as you need. Make the last click on the first point of the path to make it closed. Also, you can finish drawing by activating the selection tool. In this case the program will close the path automatically. Images you create here are solid shapes, not contours. the counter-clockwise direction. The areas where the shapes overlap are different. 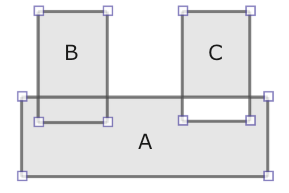 The intersection area of A and B remains solid, when the intersection of A and C is a hole. You add anchor points when you draw a path. To add more anchor points, activate the adding tool 3 and click on a path segment. To choose other type of an anchor point, click the type button 5. To move an anchor point drag it with the mouse. A straight segment attached to this point will change its direction. A curved segment will change the direction and shape. The original data for an Art Text document is text or an image (object). At the beginning you add text or choose an image and then apply graphic effects to it. A document can contain multiple objects. Combining them, you can create a complex design. Each individual object is located in its own layer. An object is a vector shape or icon, text (vector by its nature) or raster image. Raster images do not support transformations. To apply materials, a source image should have areas with different transparency (not 100% over the whole image). Otherwise, a 3D effect will be applied to the rectangular image bound instead of image details. Not all effects can be combined with others. You can apply one of this: plain color fill, gradient fill, texture or material. You can apply only one transformation to an object. Most effects can be applied to several selected objects. To open the fill tools, choose the Fill section in the Effects tab. 1 – The Plain Color tool. 2 – The Gradient tool. Choose linear or radial gradient. 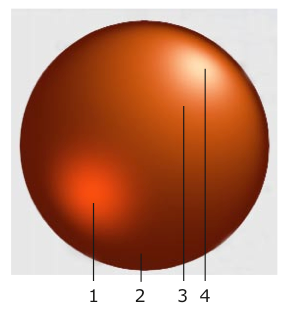 4 – An additional gradient color. It appears between two main colors. 5 – The Intensity parameter defines how the image space is distributed among colors. 6 – An angle of the linear gradient. 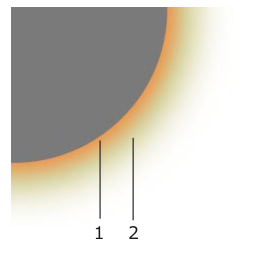 7 – The radial gradient’s control. You can change the location of the middle color. Art Text can apply textures to text and images. 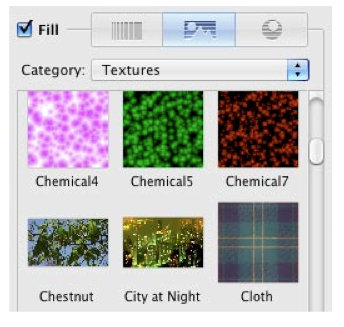 Textures can be taken from the built-in library or from your hard drive. To open the library of textures, choose the Texture section in the Effects tab. Choose the Finder item to use images from your hard drive. You can select an individual image, one or several folders. Finder and drop onto an object on the canvas. Two radio buttons below thumbnails define how a texture should fit the image area. The Auto option resizes an image automatically. The Tile option lets doing this manually. The original shape to which a texture is applied. The original image used as a texture. 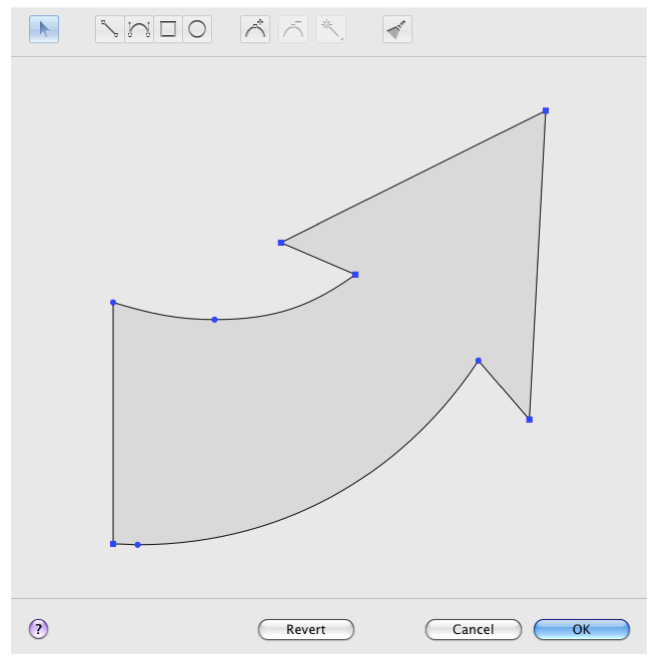 Auto > Stretch deforms an image to fit the shape. Auto > Shrink fits the texture to the larger shape size. A part of the texture can be invisible. The Tile option lets you choose the texture size and position inside the shape. Materials are used in Art Text for creating 3D looking text and images, to give glassy, metal, plastic look to an object, and for other effects. The built-in library of materials is located in the Shading section on the Effects tab. 1 – Material category selector. 2 – The thumbnail of a material. The applied one has white background. 3 – 3D shape (bevel) selector. It is not available for image-based materials. 4 – The amount of the bevel effect. 5 – Rotate the applied material. 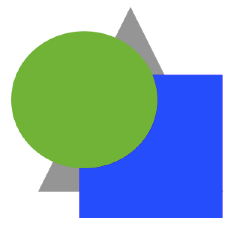 For 3D looking objects, this control moves light spots around the center of the object. 6 – Color. By default, color of the original material is applied. You can change it. There are two kinds of materials: based on shader technology and based on images. The majority of materials are shader-based. 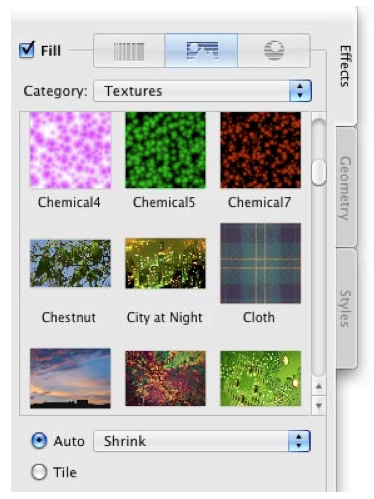 Image-based materials are grouped into separate categories in the library. To apply a material to an object in the active layer, choose a material category (1) and click on a material thumbnail (2). When you apply a material to an image opened from a graphic file, be sure that the image has areas with different transparency (not 100% over the whole image). Otherwise, a 3D effect will be applied to the rectangular image bound instead of image details. This option is available only for shader-based materials. Note that straight and concave shapes can produce similar results. To get different pictures, use materials with a light spot near the center. The Light control moves the light spots around the center. This lets you simulate light falling onto a 3D object from the top or from a side. When your design consists of several 3D objects, you can adjust the location of light spots as if they appeared from the same light source. At lower values you will get an object looking almost flat. The slider covers the most appropriate range of values 0 – 20. To set greater values, use the edit box. An image below shows circles with the Depth parameter set to 7, 15 and 30. At the same Depth value, the result depends on the size of the object. After some point, increasing Depth will not change the final image. Small objects can loose 3D look at too large values. See how circles 50x50, 100x100 and 150x150 pixels look at Depth = 15. 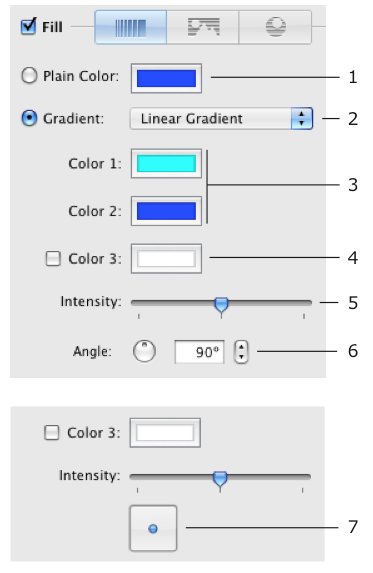 The Color control changes all colors in a way similar to the Hue parameter in the standard Colors panel. Black, white and grayscale colors will stay unchanged. Art Text material editor lets you create two types of materials: materials based on shaders (light spots) and materials based on images. To create a new material, select Create a Material in the material category drop-down list. To edit an existing custom material, double click on its thumbnail. You cannot modify a built-in material, but you can modify and save its copy. To do this, double-click a material thumbnail in the library. In a shader-based material, light spots on a specular surface are simulated to create 3D looking objects. 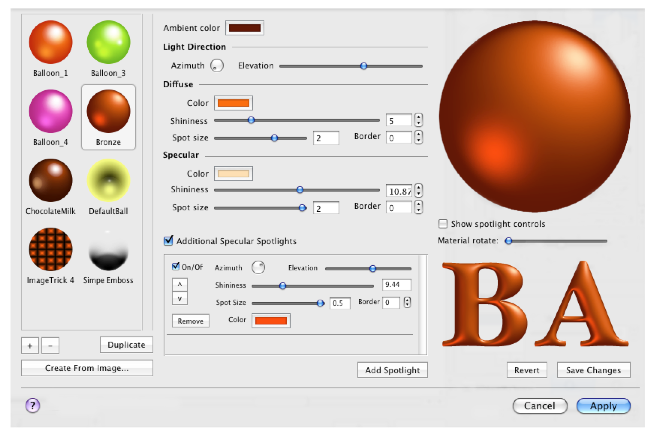 The editor of materials allows you adjusting light spots and previewing the result on a sample sphere and on letters. The window of the editor shows a list of custom materials. Buttons below the list let you add, remove and make a copy of the selected material. The middle part of the window shows parameters of the selected material. Samples of an applied material are displayed on the right. 1 – Additional specular light. 2 – Ambient color. 3 – Diffuse color. 4 – Main specular light. The ambient light is emitted by a general indirect source. In 3D graphics the ambient color is used as color of object part laying in shadow. Without the ambient light (color is set to black), the object in shadow is black. Diffuse is not really a source of light. Diffuse color is used to describe how the object will look at poor white lighting. It is used to make an object have some color when it is under light. Specular light is the light reflected by the object in some direction. It seems like highlight from spot light source. The program supports multiple specular light sources. To add more specular highlights, click the Add Spotlight button. To turn on/off all additional spotlights, use the Additional specular spotlights option. For separate control, use On/Off options of individual spotlights. Azimuth defines the horizontal direction from which the light is shed. In other words, the Azimuth control rotates a light spot around the sample sphere center. Elevation defines how high the light source is located. The central position of the slider sets the source right above the sphere. Shininess defines the intensity of reflected light. Shininess is used in 3D graphics to show how the highlight from the given spot light source looks from different viewer’s positions. When the look direction coincides with the direction of the reflected light, the highlight has maximum brightness. This corresponds to the minimum value of Shininess. Spot Size defines the size of highlight. At greater values of the Spot Size the surface looks matte, at lower - glossy. Border sets how smooth the edge of the light spot is. Apart from the Azimuth and Elevation controls, the location of spotlights can be changed right on the sample sphere. For this, select the Show spotlight controls option. Small circles that appear in the preview are handles. Drag a handle with the mouse to move the corresponding light spot. The bigger handle corresponds to the main specular light. Using images, you can create materials that give a result similar to shaders as well as completely different pictures. 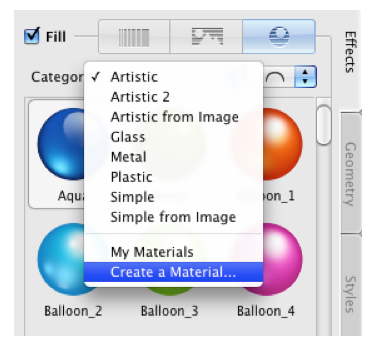 To create a new material, select Create a Material in the material category drop-down list. 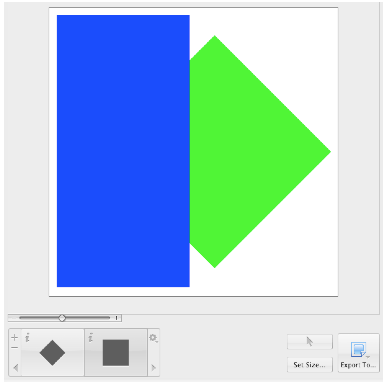 In the material editor, click the Create from Image button and choose a graphic file. Then close the editor. Any further adjustments can be made in the main window. A similar result can be achieved using shaders. The stroke effect makes text and vector shapes outlined. If you apply the tool to an imported image, its rectangular edge will be outlined. The Stroke tool is located in the main window, the Effects tab. 2 and 3 – The Remove and Add Line buttons. You cannot delete the last line. If you don’t want it, turn the effect off using the check box. 4 – The Width control defines the width of the current line. You can add multiple lines with different width and color. If spaces between letters are too small, set a larger value of the Kerning parameter. Double-click the layer icon below the canvas to open the text editor. Kerning is located at the bottom of the editor. The Shadow tool is located in the bottom-right corner of the main window. 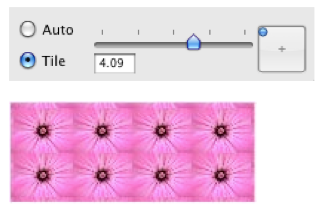 1 – The Blur parameter. 2 – The Distance between the object and shadow. 3 – The angle of the shadow. 4 – The shadow location control. It changes the distance and angle at once. 5 – The color of the shadow. 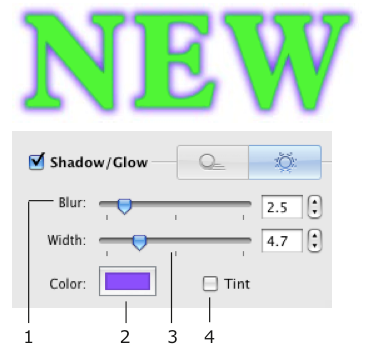 The Glow tool is located in the bottom-right corner of the main window. 1 – The Blur parameter. 2 – The color of the glow effect. 3 – The width of the glow effect. 4 – Tint color check box. When it is selected, the second color button appears and you can create bi-color glow. In the picture below, (1) is the main color and (2) is the tint color. 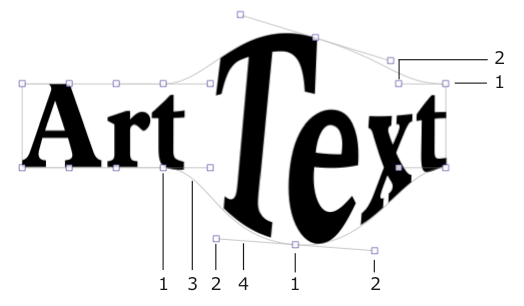 Transformation effects create geometric distortion of text or a vector image (shape or icon from the internal library). Transformation does not work with custom images. Using the transformation tools, you can also change the text or image size. The transformation tools are located in the Geometry tab. To apply a transformation, click on its thumbnail and adjust one or several transformation parameters. Geometric transformations have dark shapes on thumbnails and are located at the top. An image or text has a frame with handles. Moving the frame corner handles resizes the content proportionally. With the Shift key pressed, the proportion of sides will change. Moving the side handles changes width or height of the content. With the Option key pressed, you will scale the frame from the middle, rather than from the side. Frame handles of the Frame transformation allow you to change the shape of the frame itself. Unlike other geometric transformations, it allows you to move the handles separately. 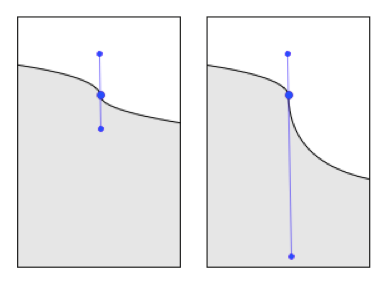 Spline curves are linked to an image or text. When you change the shape of a curve, the content changes accordingly. A spline curve is controlled by two types of handles: knot point (1) and direction line handle (2). The curve consists of one or multiple segments (3) with knot points on its ends. The Spline-Curve transformation lets you adding curve segments. Others have constant number of segments. The shape of the curve is determined by the length and slope of the direction line (4). To control a direction line, drag its handle (2). For more significant change, move knot points (1). 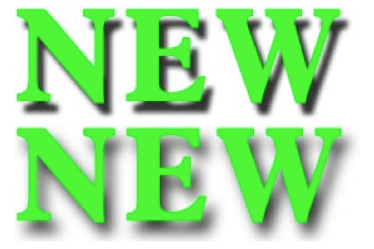 Note that the Curved Text transformation does nothing with a single letter and an image except for rotation and resizing. A transformation result can be used as a separate effect or as a part of a complex design. The Resize button lets you choose the transformation adjusting mode or the resize mode. The resize handles are square. The transformation control handles are round. You can change the object size by moving handles. In addition to this, there are two buttons. The Fit to Document button resizes text or image proportionally so that its bigger size fits the documents size. The Use Font Size button restores the original text size. After clicking the button, the size of letters corresponds to the font size set in the Fonts panel. Your work can be exported to a graphic file or copied to the clipboard. Depending on the effects you have used, you can get a vector or raster image when saving to the PDF format. Vector images are created only when you use plain color fill, stroke and transformation effects. If other effects were used, you will get a raster image. To export an image to a graphic file: 1. Check the image size. For this, click Set Size in the main window. 2. Click the Export To button and choose Export to File in a pop-up menu. Or choose File > Export. 3. Type file name and choose the destination folder. 4. Choose image format in the Format drop-down list. 5. Adjust other settings if they are available for the selected format (resolution, quality, compression, transparency). Check image resolution in the program Preferences (Art Text > Preferences). Then click the Export To button in the main window and choose Copy to Clipboard. 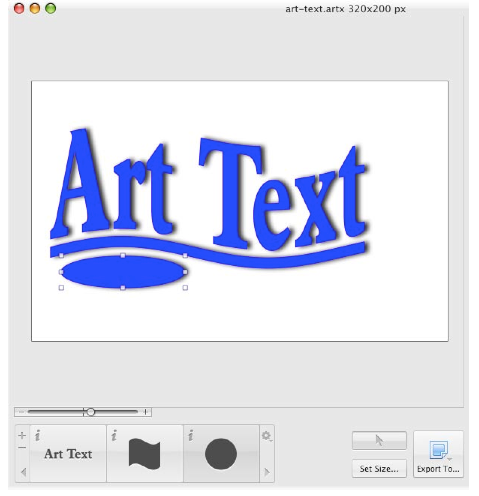 Art Text can create and export images with transparent background. For this the following conditions should be met. To export an image with the transparent background (alpha channel), your design should have the transparent background. To check this out, switch the canvas to the Chessboard background in the program Preferences (Cmd-,). The chessboard will be seen through transparent parts of your design. When you export your work to an image, use a graphic file format that supports transparency (alpha channel). In Art Text, choose one of the following formats: PDF, TIFF, PNG, GIF (set Include Transparency), EPS. It doesn’t really concern Art Text, but you should know this. Applications that will receive an image (exported or copied via the clipboard) should support the alpha channel. If an image has white or black background in another program, export from Art Text with another file format. When you export to the graphic format that doesn’t support transparency, the transparent parts are filled with a solid color used for the canvas background. This color is white by default. To choose another color, open the program Preferences dialog (Cmd-,) and select the Solid radio button. Then select the color.